I've often viewed the stereotypical Aries as someone with an overwhelming amount of passion and fire within. One of my earliest crushes from childhood was an Aries- strong, warm, friendly and outgoing. He made my heart race faster than anyone had ever done before. A good friend whom I lost at a young age was also an Aries male. Always the life of the party and so well loved by everyone he knew. These days, I work alongside a number of Aries women and have witnessed that they share similarities that may be attributed to their natal chart placement. Independent, spirited and generally well-liked, this is a sign of the Zodiac that is very often in a leadership position. 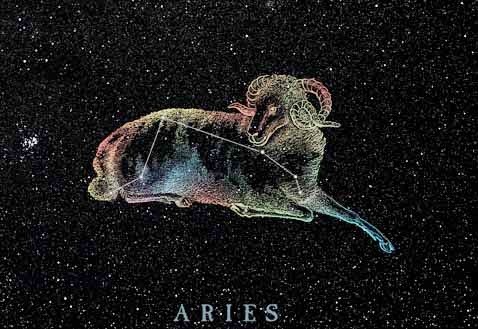 If you look to someone for advice or at the top of their field, an Aries may likely be there. As I worked on this post, it occurred to me that I quite like the Rams. As an Aquarius, the Air-Fire pairing is rather unstoppable. *Doesn't get more Aries-sounding than this!